Apple and retailer Best Buy got cozy with a “store within a store” pilot project a couple years ago. After a successful test, the pilot became a full-fledged roll out. Last week, Best Buy finished another project: a long effort to upgrade its cell phone sales department. 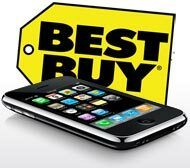 (Best Buy Mobile shops are a a joint venture with Britain’s Carphone Warehouse). Putting the Apple and Phone upgrades together, Best Buy selling the iPhone would seem a natural fit. That’s exactly what was announced Wednesday. The companies announced the iPhone will go on sale at 970 full sized Best Buy Stores and 16 satellite Best Buy Mobile outlets. The deal will make Best Buy the first U.S. retailer to independently sell the phone. Previously it’s been available only from Apple or carrier partner, AT&T. Best Buy will begin selling the phones on September 7th. Piper Jaffray analyst Gene Munster and his team have upped their projections for the number of iPhones they expect Apple to sell for the September quarter. While the firm was originally predicting sales of 4.1m, their now projecting 4.47m The basis for the adjustment includes 25 hours of in-store observation at Apple retail locations. From those observations, they’re claiming Apple is selling an average of 95 phones a day. UBS Investment Research analyst Maynard Um is being more conservative. He’s reportedly saying that each Best Buy store would have to sell about 200 iPhones to move Apple’s earnings per share by one cent.